Do you have any questions or concerns about our neighborhood? Do you have ideas about ways to make Rutherford even better? Are you in search of an opportunity to serve in your community? We’ll discuss the coming year’s activities and how you can be involved: Yard Sale, National Night Out, Fall Festival, Santa Visits and more! 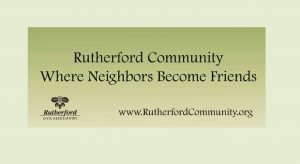 Help us organize a Rutherford slogan contest! Help us explore how we can best use social media and newsletter to build community! What do YOU want to talk about? Come and share your thoughts!